This is an amazing and really I would say informative book, considering it’s based on a character seen all too briefly in Universal’s BRIDE OF FRANKENSTEIN. In this book, she doesn’t die in the fire but escapes, carrying Dr. Pretorius to safety. She goes to live with him in his house, which is inhabited by his creations, gargoyle-like creatures made and modified from human body parts (which fittingly he calls them The Children of Cain). He’s like a kinder version of Herbert West from RE-ANIMATOR, as there are strong feelings between the creator and his creations. There’s also Cesare, the doctor’s assistant, who has narcolepsy and falls asleep unexpectedly, and Thea, Cesare’s strong-willed sister. They all become friends with ‘The Bride’, who takes the name Pandora, after hearing the Greek myth (Which I thought was very fitting). The mythical Pandora was said to be responsible for releasing death and pestilence on mankind, yet also brought with it hope and this new Pandora has a hope of establishing a new life for herself even though she’s a walking corpse. She’s also a very strong willed woman, something not socially acceptable at the beginning of the 20th Century. This group of people flee their small town after the villagers suspect Dr. Pretorius of killing young women, so they go, with Thea’s urging, to Berlin. They travel there in a covered wagon, disguised as a side-show attraction. Even the horse they use has been modified by Pretorius – it’s huge and is a fire-breathing meat eater. They also encounter Dr. Frankenstein, who wants his female monster back, and eventually the monster himself, who eventually becomes their ally. Dr. Frankenstein here is clearly the evil one, going so far as to kill innocent women for their bodies, with the desire to make them into ‘perfect’, subservient women. 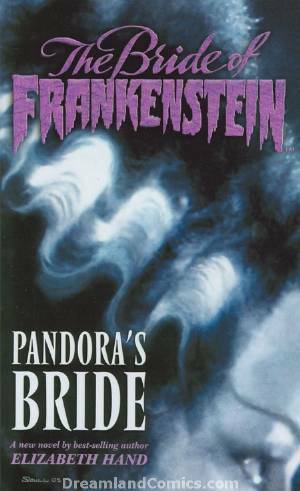 One thing I really liked about this book was how evil a man Henry Frankenstein really was, something that dug into allot deeper than they did the film. Once in the city they also have to contend with an infamous child murderer and a robotic woman, called a Fembot, which I thought was a cool nod to the Fritz Lang movies ‘M’ and METROPOLIS. I will defiantly keep a look out for anything written by Elizabeth Hand. Looks like I will also have to give the other Universal Monster books by Dark Horse a try. This entry was posted on November 26, 2009 at 8:19 pm and is filed under Books and Magazines. You can follow any responses to this entry through the RSS 2.0 feed. You can leave a response, or trackback from your own site.